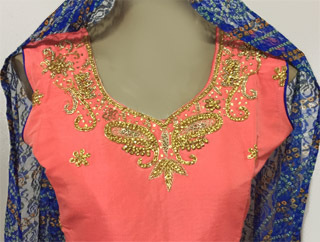 Meenal's Indian Fashions carries a gorgeous selection of latest fashion Parallels, Salwar Suits (Long and Short), Patialas (Punjabi, Afghani, Harem-style), Kurtis, and daily-ware Suits. 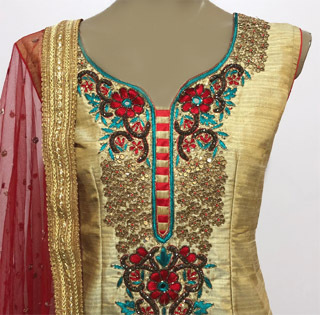 We are always striving hard to be the pioneer in bringing the latest fashion from India. MIF is the place for the trendsetters who are ready to dazzle the parties with the perfect dress and accessories. 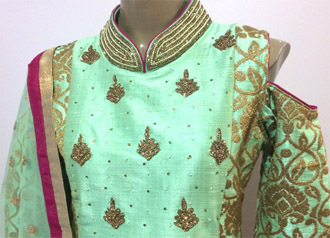 Exclusive Suit with banarasi patiala salwar with net chunni and crepe silk kurta with embroidery. 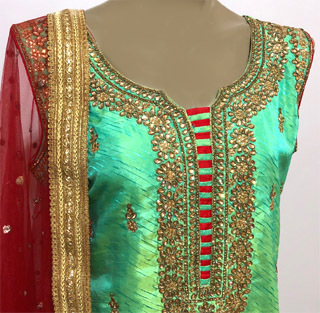 Exclusive Suit with bandhani style patiala salwar and chunni and crepe silk kurta with embroidery. Available in multiple colors. Call to check on availability.